Anna Harris is the private secretary to wealthy New York socialite, Helen Spencer and for the past year has lived a fast paced life filled with glitter and glamour. This lifestyle is horrifyingly shattered when she stumbles upon the body of her boss, who has been brutally stabbed to death. A menacing warning, “Run,” has been written with victim’s own blood on the wall, and in that moment she knows that the idyllic life she has been living was a deception. Fleeing the scene, she drives across country to Los Angeles, where she attempts to find peace and security. She changes her name to Irene Glasson, which she thinks has a “Hollywood ring to it” and accepts a position as a cub reporter at Whispers, a small tabloid newspaper. Her quiet life is shattered when murder follows her west. A hot lead about a lured affair between up-and-coming actor, Nick Tremayne and starlet Gloria Maitland takes Irene to the lavish and private Burning Cove Hotel, 100 miles north of Los Angeles. Arriving for the midnight appointment, Irene finds her source, Gloria Maitland, dead at the bottom of a pool. Once again she finds herself fleeing the scene of a murder, but this time Irene is determined to prove the drowning was not an accident. She partners with Oliver Ward, formerly a famous magician and now the mysterious owner of the hotel to discover why this woman may have been silenced. Seeking the truth, they both soon learn that the glamorous paradise hides dark and dangerous secrets. Amanda Quick (Jayne Ann Krentz, who also writes as Jayne Castle), has written more than 50 New York Times bestselling novels. 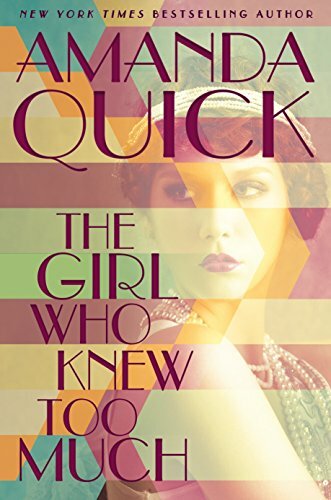 In her newest release, The Girl Who Knew Too Much, Quick transports readers back to the golden age of Hollywood and through clever plot twists unmasks the gritty realities that hide behind tinsel town’s glitzy facades. The Girl Who Knew Too Much is a solid murder mystery, although not one of Quick’s best efforts. It is ripe with details and dialogue. Its short chapters accelerate the story forward at breakneck speed. Main protagonists, Irene and Oliver, are amiable but aren’t easy to attach to. Both are complex characters, so it takes some time to get to know each of them. There are several confusing storylines and trying to keep track of it all is not always easy. Some of the villains you know right away and some are surprising. Nonetheless, The Girl Who Knew Too Much is a fun, spunky, read that contains plenty of simmering sexual chemistry, which will most definitely satiate the most ardent fans of Amanda Quick. Although it’s a little bit anti-climactic once it’s over, lovers of romantic historical murder mysteries will enjoy the suspense, characters, and atmosphere of old Hollywood.